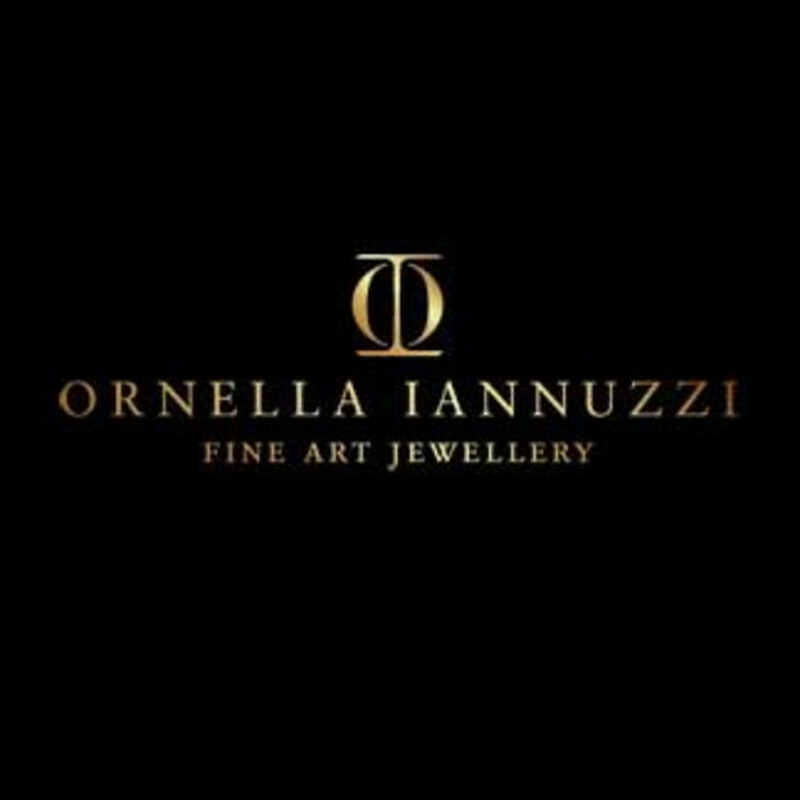 Ornella Iannuzzi is an established award-winning artist-jeweller based in London (UK) and her work offers the quality of traditional high-end jewellery with excellent craftsmanship applied to a very innovative and sculptural approach to fine jewellery. 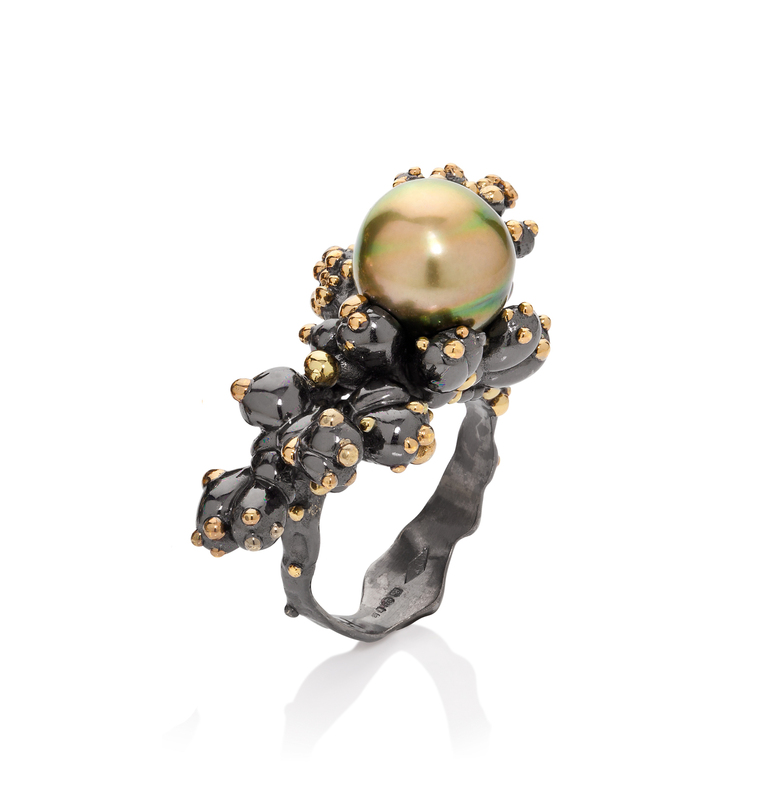 Her distinctive avant-garde signature style was rewarded with 3 major awards this year: The Goldsmiths' Company Gold Award, the IJL Fine Jewellery Gold Award, and the "Jewellery Designer of the Year" title at the 'UK Jewellery Awards 2015' last month. All her one-off creations of ‘Fine Art Jewellery’ combine precious materials with organic elements into miniature sculptures that have an authentic and original story. In order to offer some jewellery more suitable for daily wear, Ornella has also created some ‘Prêt-à-Porter’ lines. 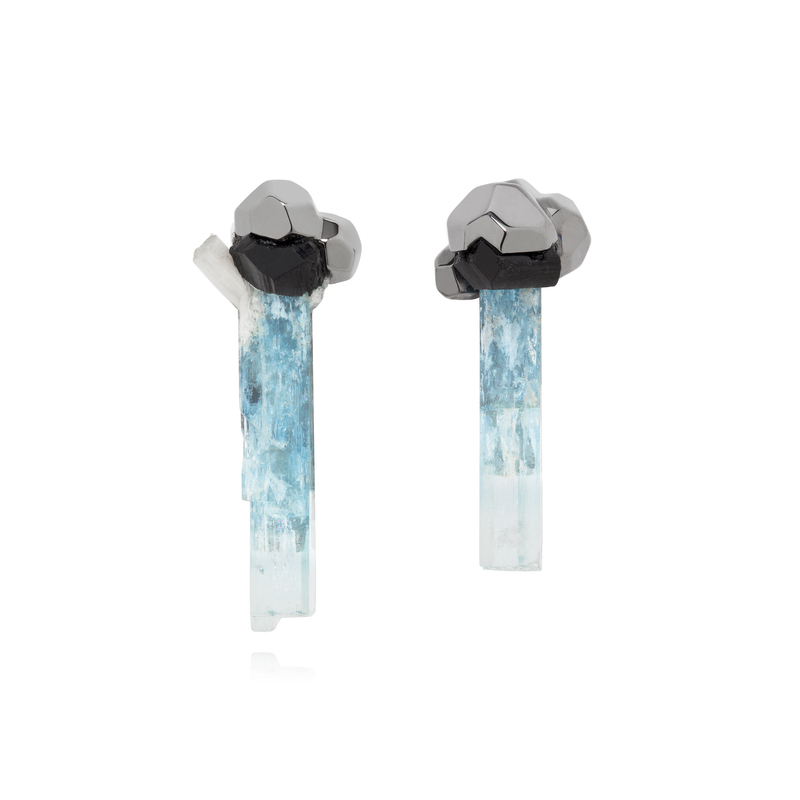 This year, she is launching an exciting new collection called “Rock It!” inspired by minerals’ crystallization. 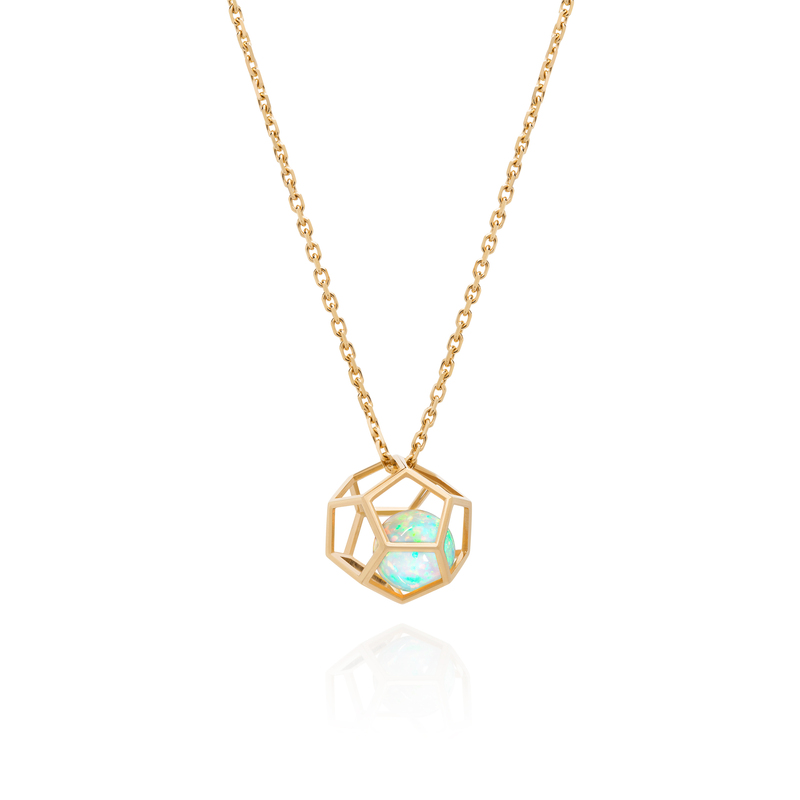 This luxury range reflects the artist’s cutting edge style with sculptural geometric designs in 18k gold, diamonds, and Ornella’s favourite gem : the opal. Earrings cage “Rock It !”with opals spheres (3.50 cts) set in 18k rose gold mounted on pentagone diamonds studs (0,18cts). 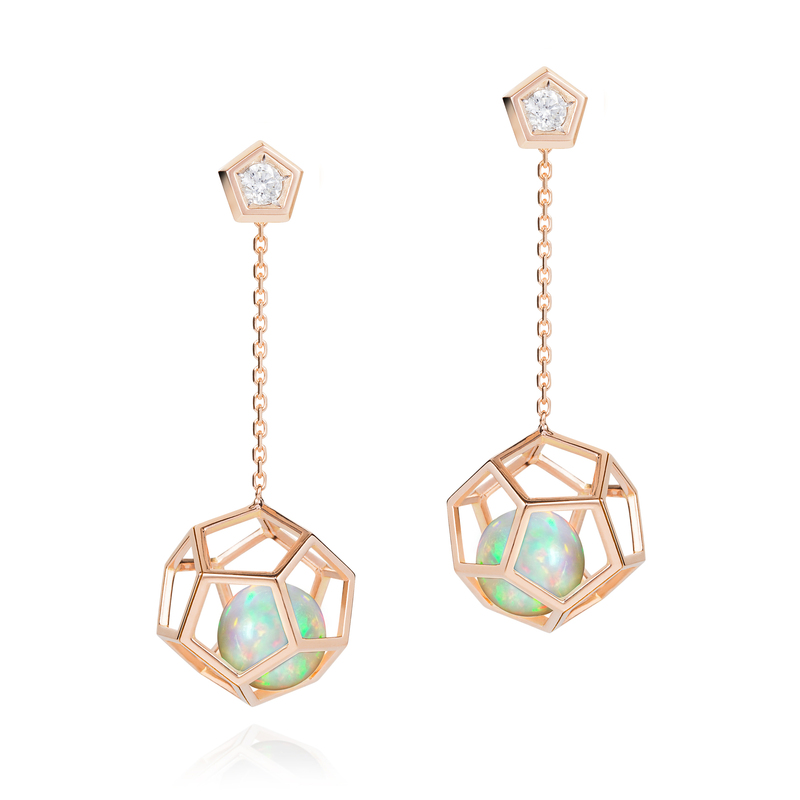 These earrings are very feminine and playful thanks to the opals free to move inside their cage, and the removable hanging cages allow you to wear the pentagone studs separately. 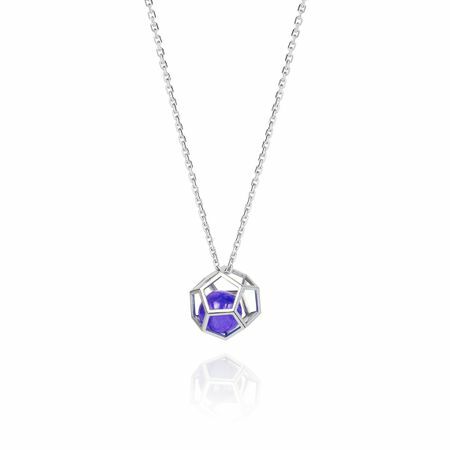 Pendant cage “Rock It !”wih tanzanite sphere (5 cts) set in 18k white gold. This unique piece is very elegant and avant-garde with a very playful aspect thanks to the tanzanite free to move inside its cage. Earrings "A l'Ere Glaciaire" with acqua-marine and schorl (black tourmaline) set in silver black rhodium (20 x 8 mm). 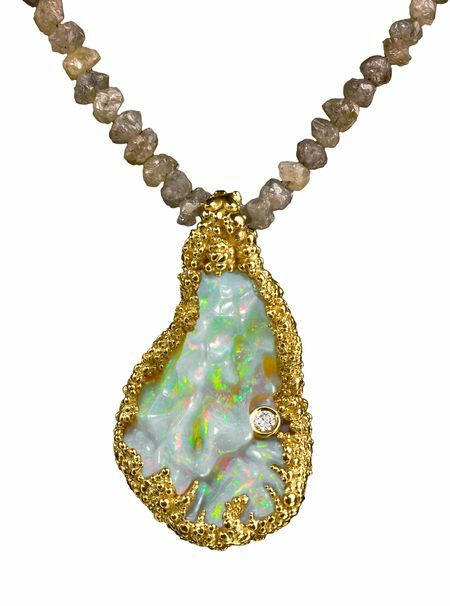 Necklace "The Blue Nile Falls"with a hand-carved Ethiopian Wello opal (20cts) set in 18k gold with a brilliant cut diamond, and mounted on rough diamonds (42cts) (44 x 24 x 12 mm). True masterpiece! Necklace "Vitris Silvestris" with a tourmaline briolette set in 18k gold vermeil, mounted with a nut and tsavorites . 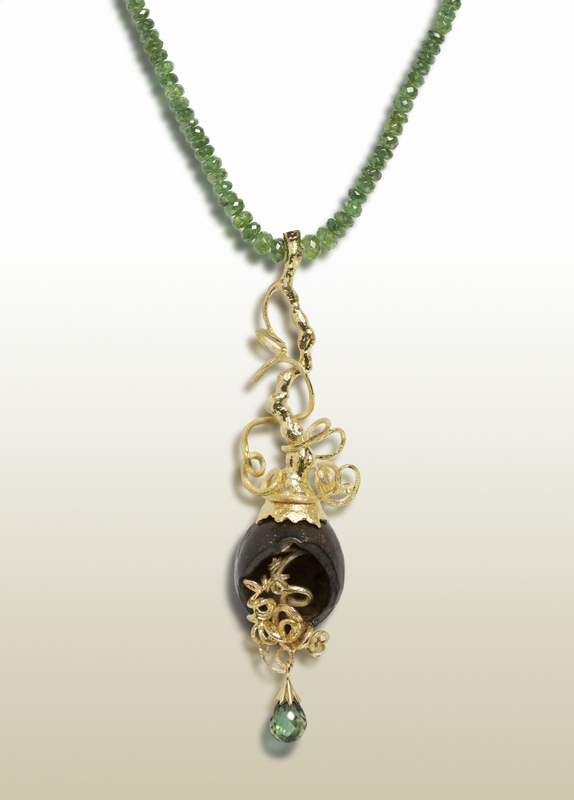 This unusual "fine art jewellery" piece reflects the avant-garde and delicate style of Ornella. 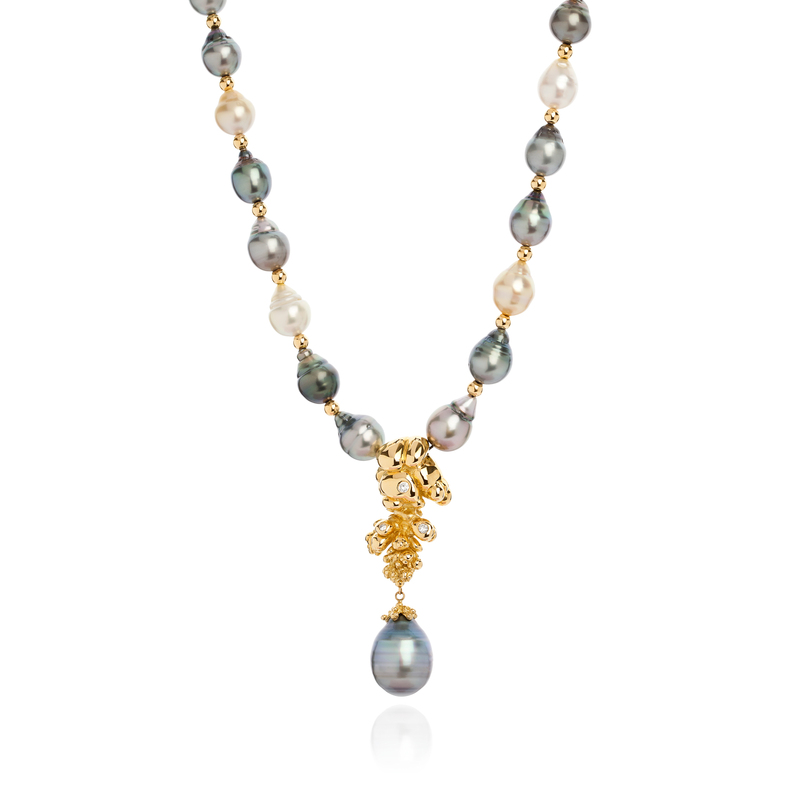 Necklace "Precious Trinity from the depth of Nature" with Tahitian pearl on 18k gold set with three diamonds, and mounted with South Sea & Tahitian pearls, 18k gold beads and 18k gold security clasp. (length 30 cm). A true statement piece that would make you the mermaid of the night! 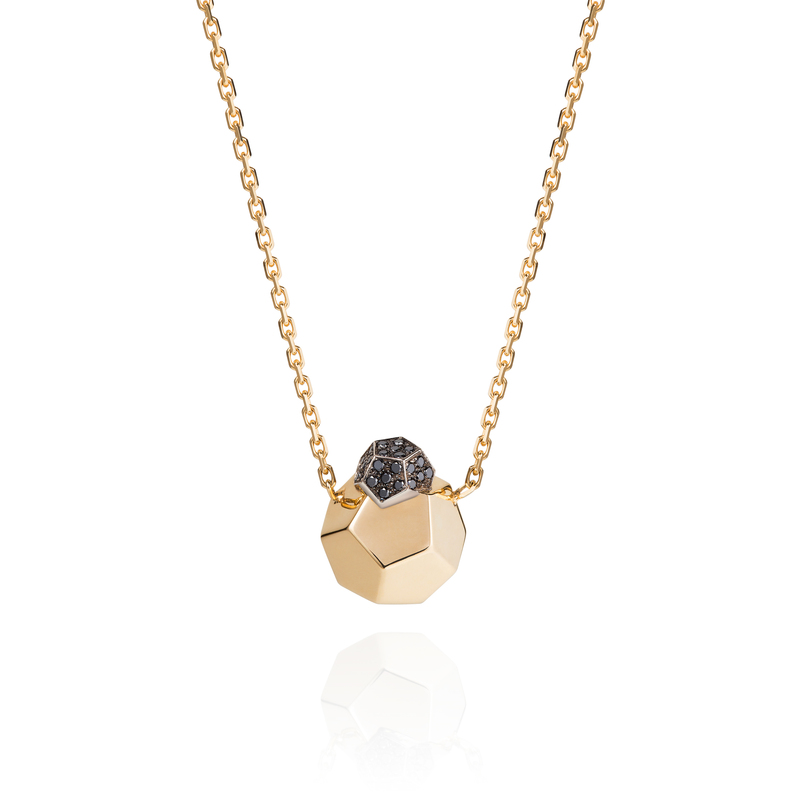 Pendant 2 crystals “Rock It !” with black diamonds (0.16 cts) set in 18k yellow gold. 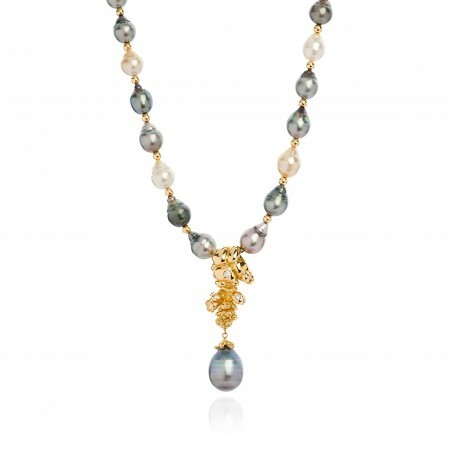 This fine jewellery piece is very elegant and feminine. The unusual shape makes it unique and easy to wear as well. Pendant cage “Rock It !” with opal sphere (2.15 cts) set in 18k yellow gold. This unique piece is very elegant and avant-garde with a very playful aspect thanks to the opal free to move inside its cage, changing colours with the light and movement. 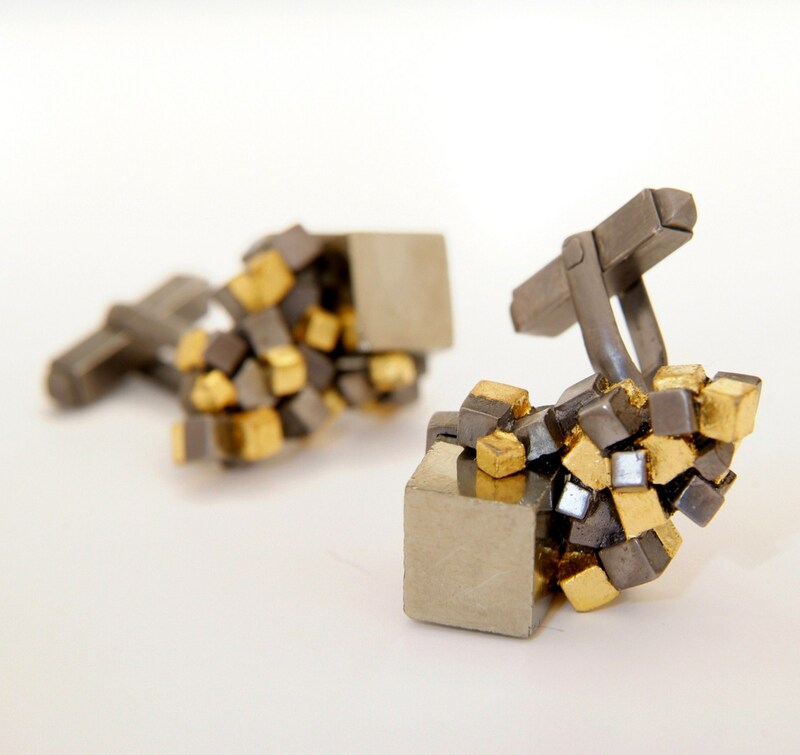 Cufflinks "Cubic Crystallization" with cubic pyrites set in black rhodium silver with 24k gold leaves. (28 x 17 mm). 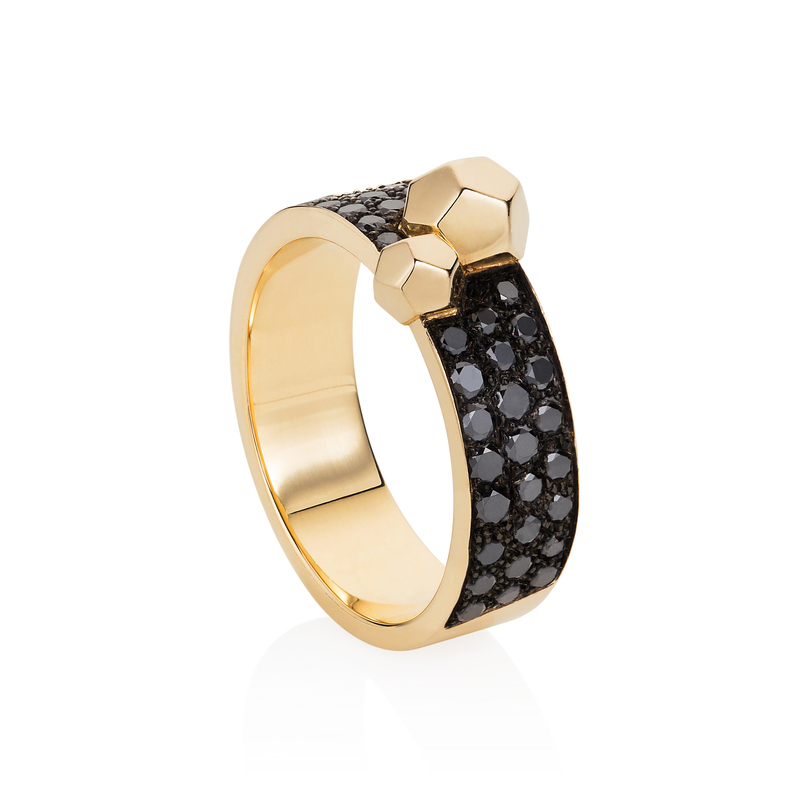 Band ring 2 crystals “Rock It !” with black diamonds (0.90 cts)set in 18k yellow gold. This glamorous ring will add extra sparkles to your finger everyday even when the sun is not out! 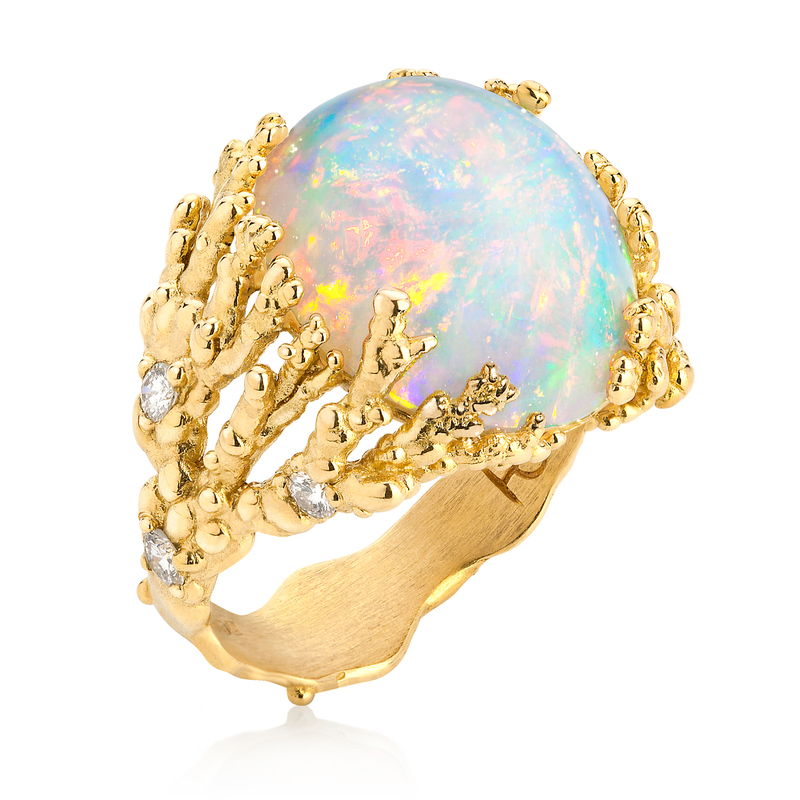 Ring "Coralline Atoll" with Wello opal cabochon and diamonds set in 18k gold. This unusual fine art piece is very feminine and will stand out in the crowd. Earrings "Something old, something new...". Azurite, sapphires and diamonds set in palladium. 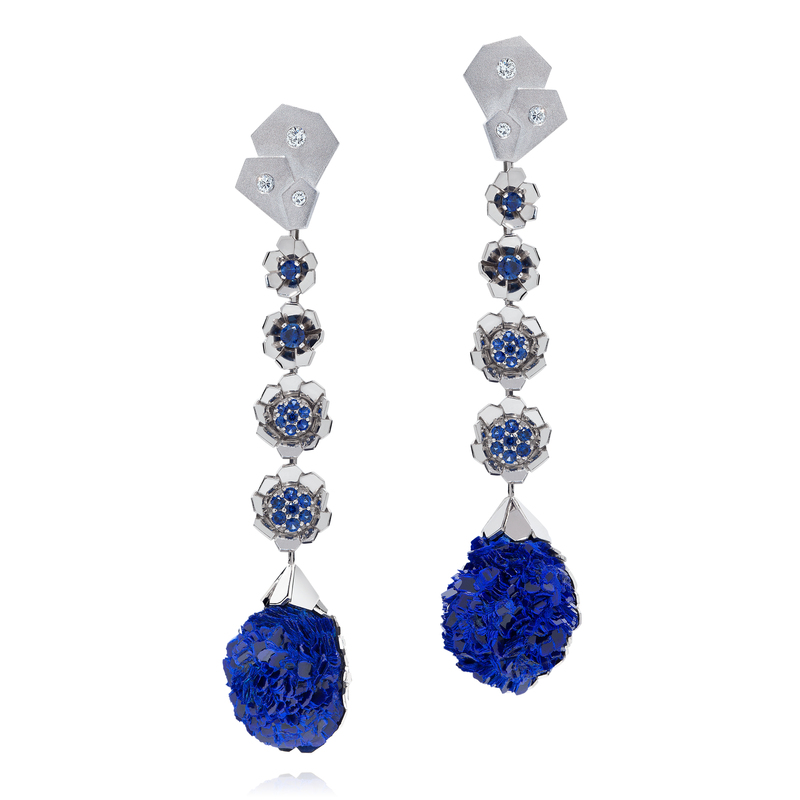 These unique pair of earrings would be perfect for a red carpet event! 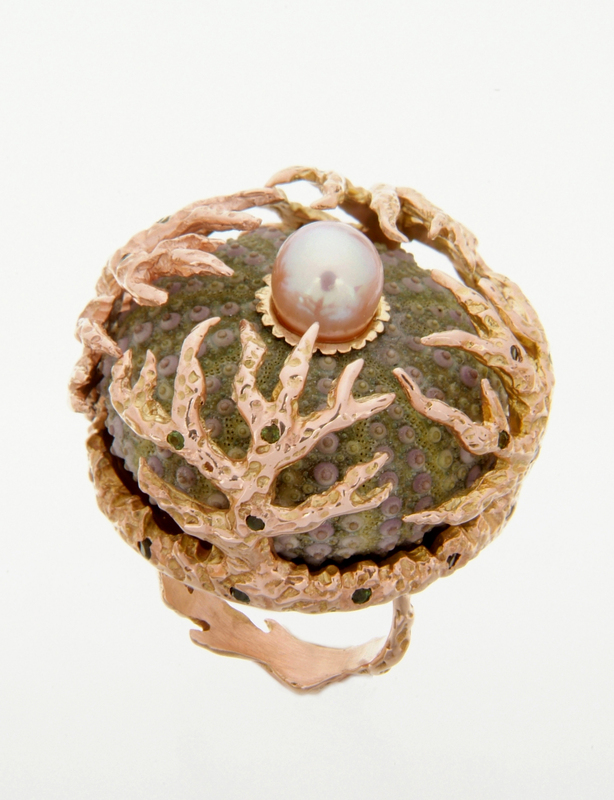 Ring "Merveilleuse Océanique" with fresh water pearl set in 18k gold, mounted on a sea urchin enclosed in red 9k gold scattered with green tourmalines. Audacious and striking artwork to wear! 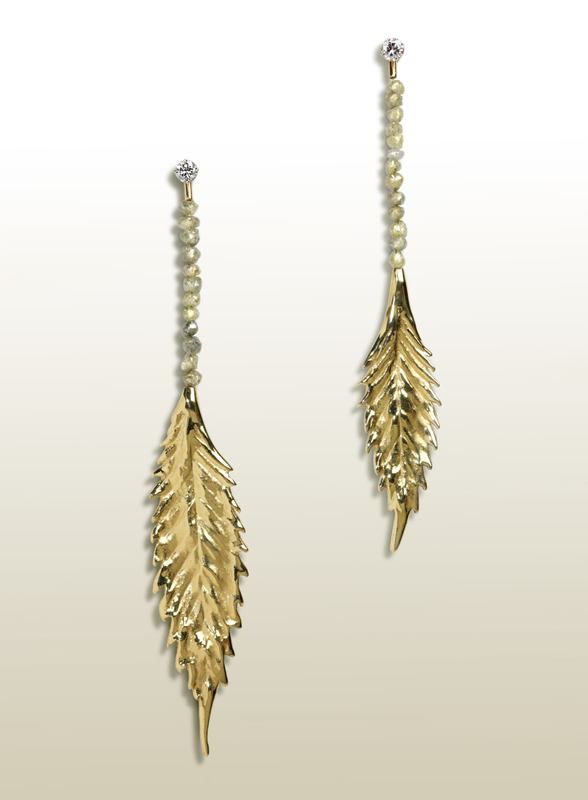 Earrings "Forbidden Fruits" with 18k gold, rough diamonds, brilliant cut diamonds set in 18k gold. These earrings are very elegant and feminine and can be worn either as small studs or as long dangling earrings thanks to the removable parts. 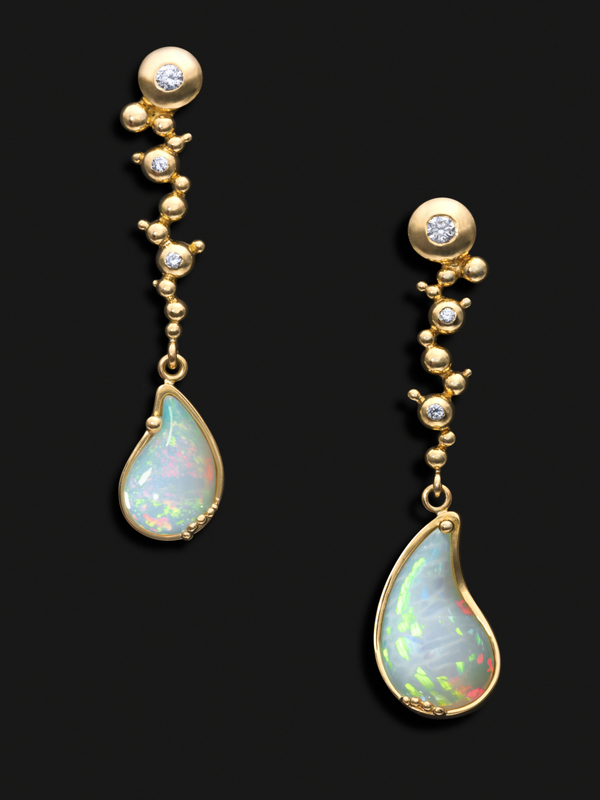 Earrings "Holy Water" with opal cabochons and diamonds set in 18k gold. ( 43 x 0.9 mm / 46 x 10 mm). Cufflinks 3 crystals “Rock It !" with diamonds (0.45 cts) set in 18k yellow gold. 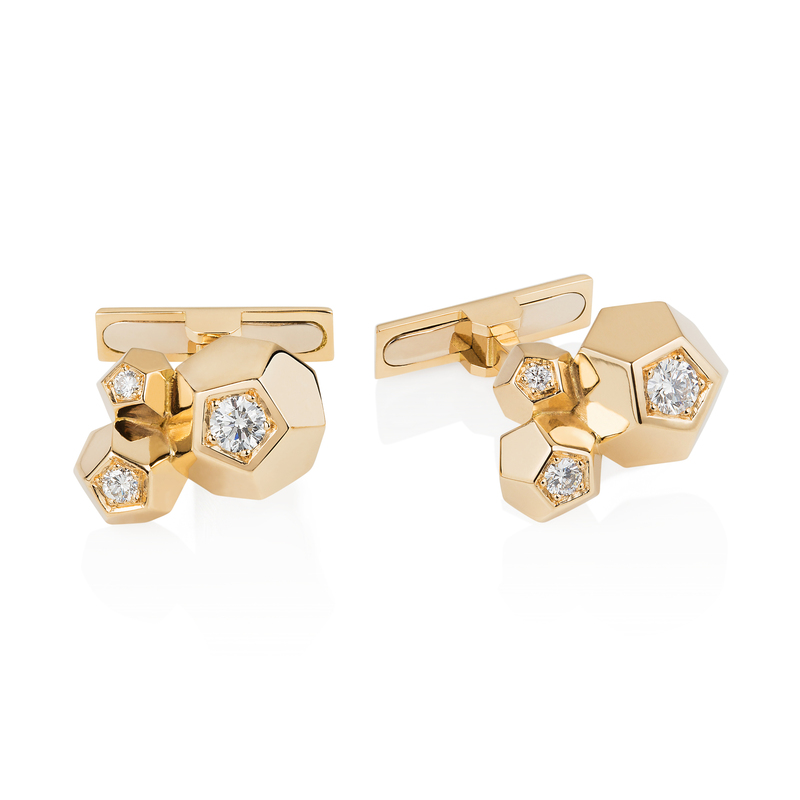 These elegant cufflinks are perfect for daily-wear as well as special occasions. Bracelet charm “Rock It !”with champagne diamonds beads (10.51 cts) and a white brilliant diamond (0.07cts)set in 18k rose gold. 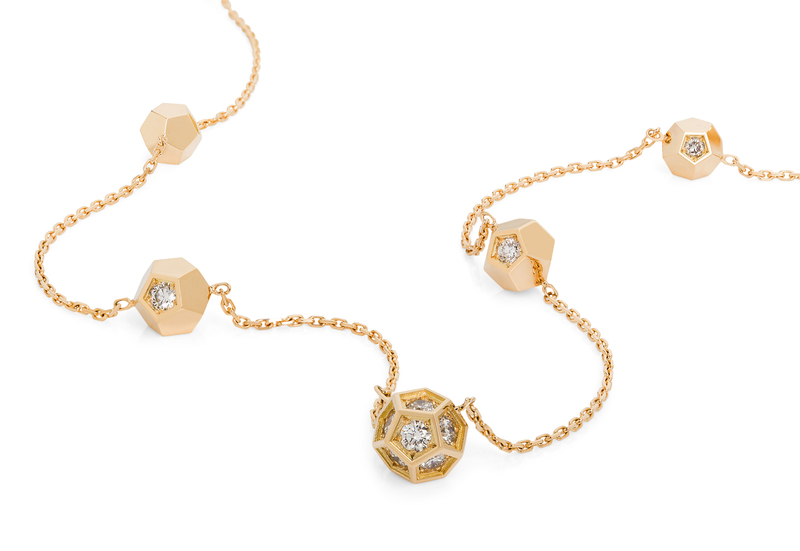 This ethereal bracelet plays with light and movement and add extra sparkles to your wrist. Studs earrings 3 crystals “Rock It !" 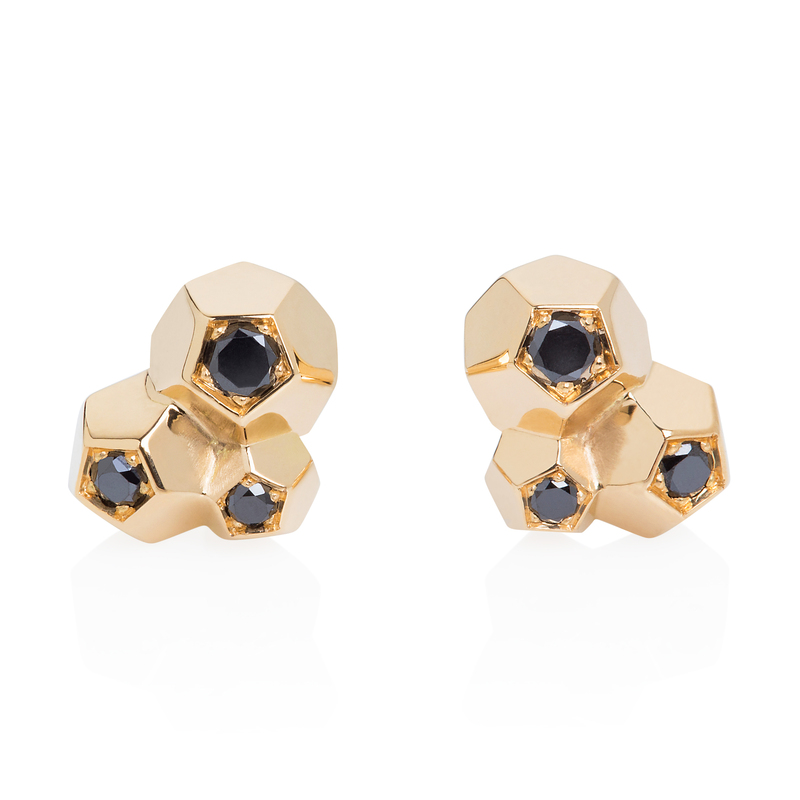 with black diamonds (0.20 cts) set in 18k yellow gold. These earrings are perfect for daily-wear and remain very eye-catching. Sautoir 9 crystals “Rock It !”with white diamonds (1.17 cts) set in 18k yellow gold. The masterpiece of the "Rock It !" collection! 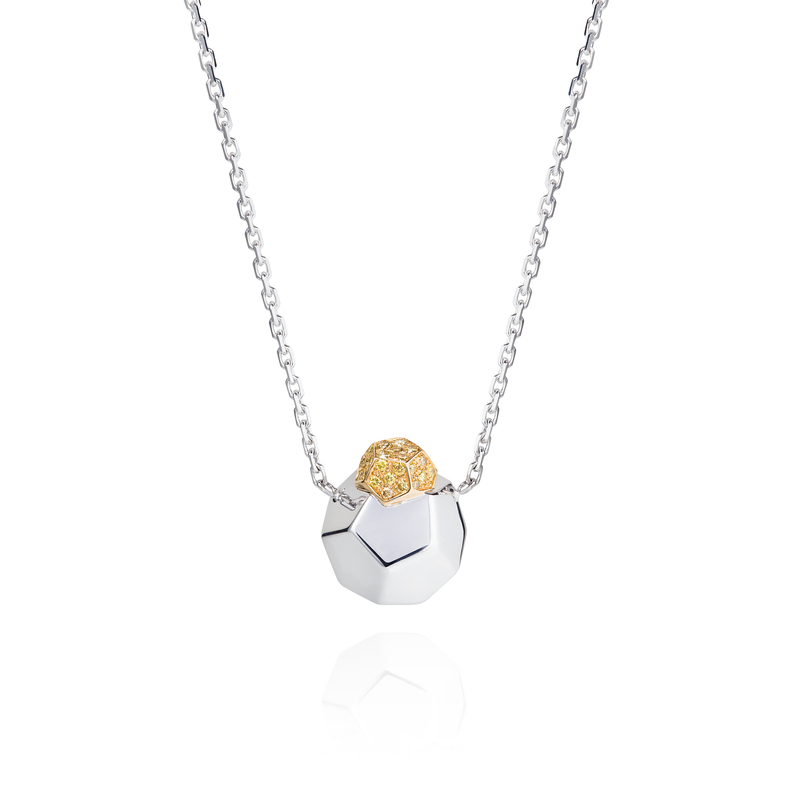 Pendant 2 crystals “Rock It !”with yellow diamonds (0.18 cts) set in 18k white gold. This fine jewellery piece is very elegant and feminine. The unusual shape makes it unique and easy to wear as well.